On Friday mornings, I wake up in a good mood. It’s not just that I know the weekend is coming and that I can sleep in the next day, which means I can drink caffeine in the afternoon like one of those carefree types who can handle the raw power of a 12-ounce can of Coke. No, the last day of the week is a good one because that’s the day my co-workers have designated Plaid Friday. And on Plaid Friday, I know exactly what I’m wearing to work. Monday through Thursday mornings, I dread getting out of bed because I know what comes next. Thanks to my ultra-conservative, conformist office environment, I’m going to have to put on some clothes. The Man is really bringing me down. I’ve had nearly 24 years to figure out how to dress myself — and believe me, I’ve come a long way since middle school’s pleather bellbottom days — but it’s no use. Frankly, I consider it an accomplishment if I’m not rocking more than three mustard stains in public. I’ve wasted hours of my life standing in front of my closet, trying to find an outfit that meets the basic requirements of clothing. 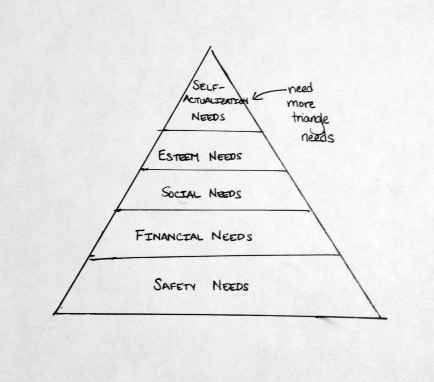 As in Maslow’s slightly-more-famous-but-hardly-more-useful Hierarchy of Needs, attaining every level is tricky. The top levels of the pyramid are often sacrificed as long as the lower requirements have been met. Allow me to explain each stage. 1. Clothing provides protection from the elements. Every time you wear a dress that’s 40% fabric and 60% air, a pragmatic cavewoman rolls over in her icy glacier grave. She tries to, anyway. 2. Clothing is clean. Things are better now that I’ve bought my own washer and dryer, but for a while I was a little shaky on this one. Using coin-operated laundry facilities meant that on laundry day I’d look at my giant pile of dirty clothes and my tiny pile of quarters and think long and hard about how good I wanted to smell the next week. 3. Bonus: Clothing doubles as shelter or food. A lot of people overlook this one, but I think it’s time we all start trying to make those shiny emergency blanket/poncho things happen. Think how safe we’ll be if we’re ever lost in the woods! Also, I’ve heard you can eat Crocs. I don’t suggest wearing them, but you could carry them around with you just in case. 1. Clothing falls within your budget. Obviously some of your expenses should take priority over your clothing budget. It’s incredibly important to have enough money to pay for your house, utilities and groceries, maintain your car and buy the new season of Game of Thrones. 2. Staple items take precedence. Forgoing new socks for months so you can afford an awesome robot dress is a good way to end up with very cold feet for most of the winter. 3. Clothing holds up for more than one season. Expensive new seasons of Game of Thrones come out every year. You can’t spend all that money covering your bits. PRIORITIES, you guys. 1. The same article of clothing hasn’t been worn in the last week. When I was nine, I tried to wear the same horse sweater to my weekly swimming lesson two weeks in a row. My mom was horrified. “Everyone at the rec center is going to think you only own one sweater!” she said. I’m not sure they would have thought that, but the social lesson has stuck with me since then. Don’t be Stephanie, Age Nine. 2. Clothing is appropriate for the setting. That means you can’t wear your “Show Me Your Kitties” T-shirt to work, even if you’re sitting behind a giant pole the whole time. You can wear combat boots or bowling shoes. At least, no one’s yelled at me yet. 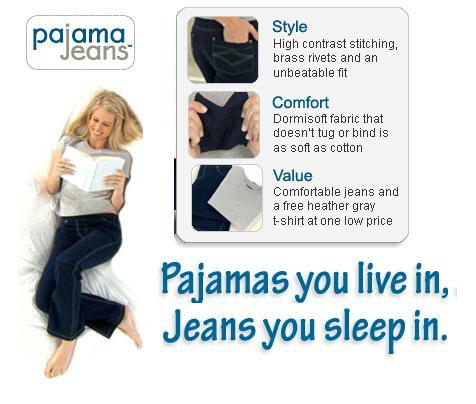 *Unless you own pajamas that look exactly like an evening gown or you regularly sleep in your tux. Anything is possible. 1. Clothing fits. Clothing that fits properly can significantly decrease the clown-like shenanigans that plague those with ill-fitting clothes. So long, tiny cartoonish hat! Later, flappy oversized shoes! See ya, giant pockets full of bicycle horns! 2. Clothing successfully emulates that of a style icon. My personal style mixes the looks of Joan Jett, Ellen DeGeneres and Juno, late in her pregnancy. I like strong women. *In unrelated news, my seduction technique remains a work in progress. 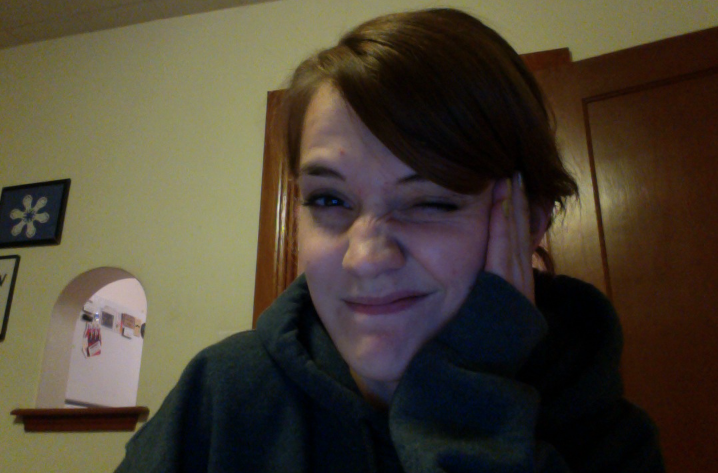 I have gotten a lot better at winking. 1. You’re a successful fashion blogger, a professional model or Gwen Stefani, probably. I don’t really know what’s going on at the top of the hierarchy. I can’t even see it from where I’m sitting, slumped over my laptop in a Christmas-themed sweatshirt, baggy jeans and hospital socks. I’m never going to achieve fashion self-actualization, but I think I’ve figured out Thursday’s outfit. Both mechanics and copy editors can wear coveralls, right? Great post! Ever since I started dating someone who works in fashion, I’ve felt the occasional keen desire to upgrade my wardrobe to something resembling style in order to keep pace. It usually passes after the second piece of cake. After many half-hearted arguments about why my ten-year old donut stained t-shirts are perfectly acceptable for any and all occasions, I will now simply present the triangle of needs as my defense. Thanks! Wow! This was amazingly organized and really funny. But I confess that another reason I liked it was I adored seeing my name on that Hierarchy chart. I’m Stephanie too. Well I guess that’s fairly obvious now. I am glad to share the name with someone as witty as you!! My old firm had a Dress Down Day which was the last Friday in the month. It was revised to ‘casual day’ (with a dress code) after half a dozen guys turned up in the office in Bermuda shorts, Hawaiian shirts and flip flops. Spoilt the whole fun element! I think “Clothing that fits” is the next thing I need to work on. I primarily wear my sister’s handmedowns — she’s a lot bigger than me, but they shrink in the wash. Which means they’re weirdly shaped. Which means I never looked particularly stylish. I should fix that. This accurately applies to my life. Love it! I knew there was more to Maslow than all that nonsense about hygiene. I think you may also be susceptible to the Hawthorne effect here – as soon as you observe (your dirty wardrobe), you begin to improve (due to fear of social ridicule perhaps? ), even without being told to do so. Simple psychology. Love your style, and I’m enjoying following your blog. I would like to thank watching too many episodes of What Not To Wear and my older sister for assisting me with getting my fashion above the first few levels of the pyramid. During college, my wardrobe consisted of cheap jeans paired with men’s t-shirts bearing quirky sayings. I have sense graduated into blouses, wrap-arounds and things bearing ruffles, but draw the line at most flower prints. I wear these things in public, and it seems to be more impressive than my college-wear. However, when at home for a day, I will revert back to previous fashions. Few of us, I think, will reach self-actualization stage. That is a mirage too far off for my imagination. 1. Does the color enhance my skin tone? 2. Does the fit and material of the piece feel so good that it seems to disappear the instant I put it on? 3. Does the price relax me? If it ain’t three out of three, it doesn’t come home with me. That’s why my sewing skills have gotten so good recently. Thanks for posting. I needed this – both the laughs and the advice. Raised in the early ’90s with a second-hand wardrobe, I had no idea how clothes were supposed to look or fit until I was at least halfway through high school. That was when my youth leader at church informed us that “Just because clothing goes on the body doesn’t mean it fits”. Wise words. A lady in my 4-H club also told me that wearing black near my face would make me look sick, so now I wear pastels year-round. If that’s a “fashion don’t”, I don’t want to know! I understand this. There us a war that happens between myself and my closet, any day I am forced to leave the house. I never win. Great post. I’m at the laundry quarters phase. Excellent post@ Thanx 4 sharing this! I think you could do a PhD on this, it is a piece of valuable research ..I have never really got above level 3 and only hit that level sporadically, and certainly would have a clue about my self-actualisation needs. What I DO do with clothing is amortise every item (stupidly I usually do this after purchase) so if an item costs $100 and I wear it only once (for whatever reason) it is expensive, but if it costs $300 and I wear it 300 times it is cheap as each wearing is only $1. What is the point of this? who knows. BTW – I am another ‘listee’, thank heavens you were FPd so I stumbled across your blog which I will now follow. I enjoyed your post! Granted, I haven’t worked in an office for a long time, I spent the last 12 years in a sawmill. My considerations were more along the lines of “Is this t-shirt too see through? I know I’ve worn it a bajillion times, but its comfortable in the summer. Mostly because I’ve washed it a bajillion times.” or “My jeans don’t have too many rips in them, do they?” “I hope no one notices the back pocket ripped.” “My work boot just blew out. Now my toes are going to get wet.” “Well, there went one sleeve, better tear the other one off.” Thank you again for an entertaining post! Bringing in the Maslow??? Brilliant! Great post, funny post. Keep it up! I am retired and got so bored that I envied working. The actualization needs fade as the only thing on the menu is the menu. What did you accomplish today is the meal you had, the bowel movement to rid your body of it and television which is death sleep. My fashion is tee shirts, shorts, I live in Florida, and sneakers. I burned all the ties but one for emergencies. The good life turned out to be the life of ennui. Really funny post. Thank you. Great post! I enjoyed reading. I’ve stopped buying things randomly. I try to only buy things I really like no matter the cost. I wear them much longer. Very funny! Loved it! Today I would say I’m on a safety-need level, unfortunately! But your text definitely made me laugh about it! Thanks for sharing! This is both true and hilarious! Getting to the top? Almost there! Well, not really. You weave humor into your writing in just the right proportion- funny enough to make your points memorable, without becoming distracting. I loved your summary of the Self-Actualization Needs. Who the heck are these people, anyway, and how do they literally always look like they stepped out of an issue of Vogue?! Good analysis. 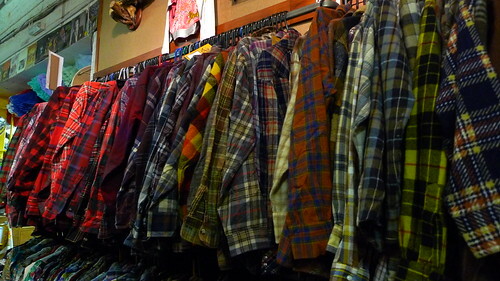 I wish my office had Plaid Day. I’m still a beginner and any suggestions are welcomed!